The Baxter was built in 1929 with the help of over 200 local investors. On the Grand Opening night, they toasted to do everything possible to make Bozeman the best place to live, and this is still The Baxter’s mission today. As many patrons today can testify, this is what makes The Baxter a building built for the community, by the community. 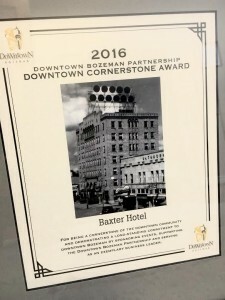 The Baxter was so graciously presented with the 2016 Downtown Cornerstone Award at the 11th Annual Downtown Breakfast, sponsored by the Downtown Bozeman Partnership. The Downtown Bozeman Association Board, Business Improvement District Board and Tax Increment Finance Board collectively select a recipient for three awards: the Downtown Cornerstone Award, Downtown Community Award, and the “Life is Downtown” Award. The Downtown Cornerstone Award recognizes a business that serves as an anchor to the downtown community economically, socially, culturally and civically. The nominated businesses have demonstrated a long-standing commitment to downtown by sponsoring downtown events and supporting the member organizations of the Downtown Bozeman Partnership, while being exemplary business leaders. 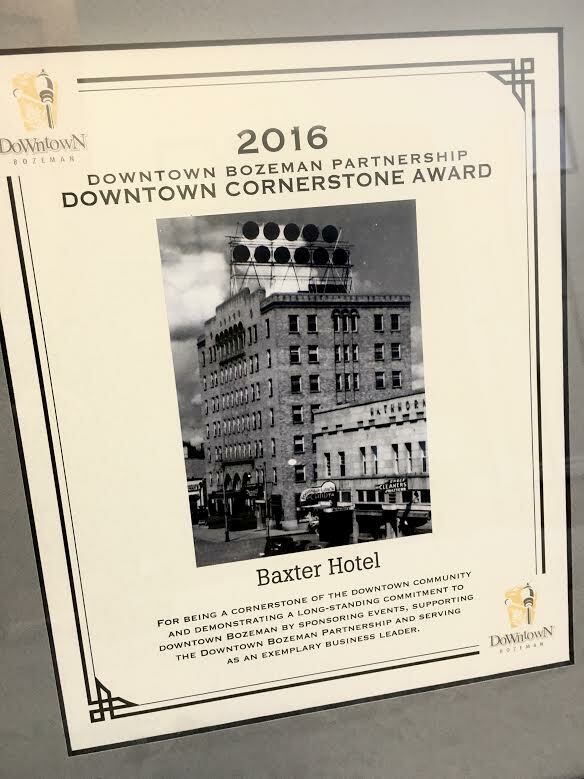 We at The Baxter would like to thank not only the DBP for this award, but the entire community of Bozeman for being a part of The Baxter from the very beginning. From weddings and non-profit fundraisers to eating a bison burger on the back patio at Ted’s, everyone has a Baxter story – a downtown Bozeman story. With over 400 public events, 300 private events, 200 people living and working in the building and an average of one thousand daily patrons, we are truly grateful for this recognition. With great pride, we have been able to reinvest in the community by sponsoring community events, offering non-profit groups special discounted rates, and donating over $30 thousand to local charities just last year. A special thank you is owed to owner David Loseff. Without his leadership, passion and vision to restore the community’s social hub, none of this would be possible. We would like to give recognition to Gallatin Art Crossing for being selected for the Downtown Community Award as well as Babs Noelle from Alara Jewelry who received the “Life is Downtown” Award. We would also like to recognize Mackenzie River and The Nova Café for being close runners-up in the bid for the Downtown Cornerstone Award. Thank you all for the support and the award; it truly was a community effort.